: The Basset was reputedly bred by monks in France in the Middle Ages to hunt in heavy cover and is able to hold its nose close to the ground. 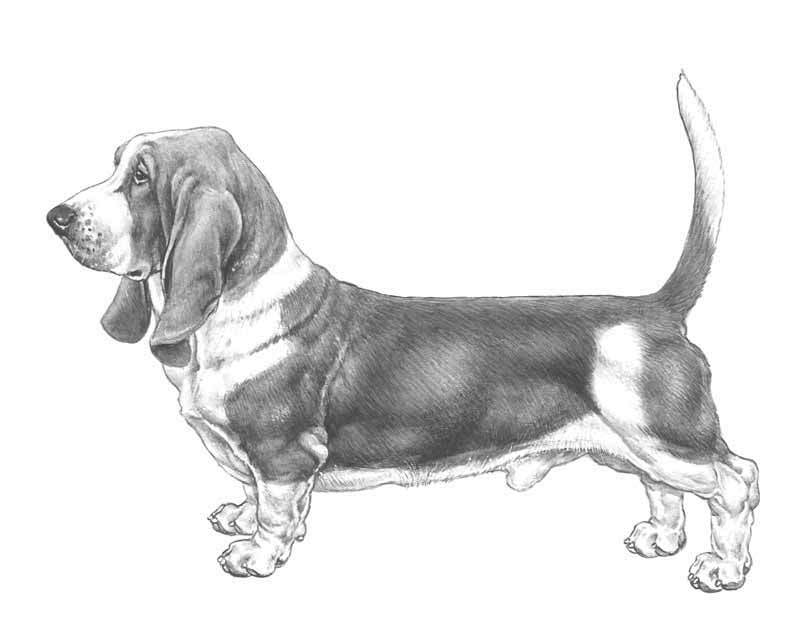 Though closely related to the entire family of French Bassets the breed was developed to perfection in Britain. He is a dog capable of hunting his natural prey, the hare, persistently at a relatively slow pace over prodigious distances. : Short-legged hound of considerable substance, well balanced, full of quality. It is important to bear in mind that this is a working hound and must be fit for purpose therefore should be strong, active and capable of great endurance in the field. : Tenacious hound of ancient lineage which hunts by scent, possesses a pack instinct and a deep melodious voice. Placid, never aggressive or timid. Affectionate. : There may be a small amount of wrinkle at brow and beside eyes. In any event skin of head supple enough as to wrinkle slightly when drawn forward or when head is lowered. : Top of muzzle nearly parallel with line from stop to occiput and not much longer than head from stop to occiput. : Domed, with prominent occipital bone, of medium width at brow and tapering slightly to muzzle. : Entirely black except in light-coloured hounds, when it may be brown or liver. Large and well-opened nostrils, nose may protrude a little beyond lips. : General appearance of foreface lean, not snipy. : Flews of upper lip overlap lower substantially. : Lozenge-shaped, neither prominent nor deep-set, dark but may shade to mid-brown in light-coloured hounds. Expression calm and serious. Light or yellow eye highly undesirable. : Set-on low, just below line of eye. Long; reaching only slightly beyond end of muzzle of correct length, but not excessively so. Narrow throughout their length and curling well inwards; very supple, fine and velvety in texture. : Long and deep throughout length; withers and quarters of approximately same height. : Rather broad and level. From withers to onset of quarters not unduly long. : Forechest fitting neatly into crook when viewed from front. Breast bone prominent but chest neither narrow nor unduly deep. Ribs well rounded and sprung, without flange, extending well back. : There should be adequate clearance between the lowest part of the chest and the ground to allow the hound to move freely over all types of terrain. : Well set-on, rather long, strong at base, tapering, with moderate amount of coarse hair underneath. When moving, stern carried well up and curving gently, sabre-fashion, never curling or gay. : Upper forearm inclined slightly inwards, but not to such an extent as to prevent free action or to result in legs touching each other when standing or in action. Some wrinkles of skin may appear on lower legs, but this must on no account be excessive. : Shoulder-blades well laid back; shoulders not heavy. : Turning neither in nor out but fitting neatly against side. : Forelegs short, powerful and with great bone. : Knuckling over highly undesirable. : Large well knuckled up and padded. In every case hound always stands perfectly true, weight being borne equally by toes with pads together so that feet would leave an imprint of a large hound and no unpadded areas in contact with ground. : Full of muscle and standing out well, giving an almost spherical effect when viewed from rear. : Hocks well let down and slightly bent under but turn neither in nor out and just under body when standing naturally. : Supple and elastic without any exaggeration. : Smooth, short and close without being too fine. Whole outline clean and free from feathering. Long hair, soft coat or feathering highly undesirable. : Generally black, white and tan (tri-colour); lemon and white (bi-colour); but any recognized hound colour acceptable. : 33 - 38 cms.